Donald L. Fixico (Shawnee, Sac & Fox, Muscogee Creek and Seminole) is Distinguished Foundation Professor of History. He is a policy historian and ethnohistorian. His work focuses on American Indians, oral history and the U.S. West. 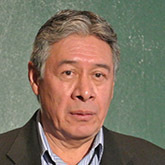 He has published a dozen books: American Indians in a Modern World (2008); Treaties with American Indians: An Encyclopedia of Rights, Conflicts and Sovereignty, 3 volumes, ed, (2007); Daily Life of Native Americans in the Twentieth Century (2006); The American Indian Mind in a Linear World: American Indian Studies and Traditional Knowledge (2003); The Urban Indian Experience in America (2000); The Invasion of Indian Country in the Twentieth Century: Tribal Natural Resources and American Capitalism (1998), 2nd ed., 2011; Rethinking American Indian History, ed. (1997); Urban Indians (1991); An Anthology of Western Great Lakes Indian History, ed. (1988); and Termination and Relocation: Federal Indian Policy, 1945-1960 (1986). He has two recent books, Call for Change: The Medicine Way of American Indian History, Ethos and Reality (2013) and Indian Resilience and Rebuilding: Indigenous Nations in the Modern American West (2013), see Cspan http://www.c-spanvideo.org/program/311752-1. Prior to Arizona State University, Professor Fixico was the Thomas Bowlus Distinguished Professor of American Indian History, CLAS Scholar and founding Director of the Center for Indigenous Nations Studies at University of Kansas. He has received postdoctoral fellowships at UCLA and The Newberry Library, Chicago. Professor Fixico has been a Visiting Lecturer and Visiting Professor at University of California, Berkeley; UCLA; San Diego State University and University of Michigan. He was an Exchange Professor at University of Nottingham, England and Visiting Professor in the John F. Kennedy Institute at the Freie University in Berlin, Germany. At the undergraduate level, Professor Fixico has taught a survey history of "American Indians Since 1900" and a pro-research seminar for history majors. He has directed independent studies, honor theses for Barrett, The Honors College and theses at the Arizona State University West Campus. At the graduate level, he has taught seminars on "Federal Indian Policy, Laws & Treaties," "American Indian History Research Seminar," "An Oral History of the American West," and "Readings in the American West." Professor Fixico has directed master's theses and doctoral dissertations and serves as an advisor to several graduate students. He has been a mentor to students as well as to junior faculty in the Provost's Mentoring Program. Professor Fixico has worked on nearly 20 historical documentaries. In 2000, President Clinton appointed him to the Advisory Council of the National Endowment for the Humanities and in 2002 he was the John Rhodes Visiting Professor of Public Policy in the Barrett Honors College at Arizona State University. In 2006, the Organization of American Historians awarded a short-term residency award to Professor Fixico to give lectures for two weeks in Japan. Professor Fixico has given lectures nationally and internationally and works with tribes and indigenous organizations. In 2012, he lectured at Sichuan University in China and Auckland University in New Zealand in 2013. Fixico, D. L. 2010. From the Seventh Direction: Writing Indian history from the heart. Journal of the West 49(4):45-61. Fixico, D. L. 2010. Introduction: Writing American Indian history. Journal of the West 49(4):9-10. Fixico, D. L. 2000. Bury my heart at Wounded Knee and the Indian voice in Native studies. Journal of the West 39(1):7-15. Fixico, D. L. 1996. A native view of the five civilized tribes in Indian territory and U.S.-Indian policy, 1830-1890. QWERTY: Arts, Literatures & Civilisations du Monde Anglophone 6(Oct):265-273. Fixico, D. L. 2013. Call for Change: The Medicine Way of American Indian History, Ethos and Reality. University of Nebraska Press. Lincoln, NE. Fixico, D. L. 2013. Indian Resilience and Rebuilding: Indigenous Nations in the Modern American West. The University of Arizona Press. Tucson, AZ. ISBN: 978-0-8165-3064-9. Fixico, D. L. 2012. Bureau of Indian Affairs. ABC-CLIO/Greenwood. Santa Barbara, CA. ISBN: 978-0-313-39179-8. Fixico, D. L. 2008. American Indians in a Modern World. AltaMira Press. ISBN: 978-0759111707. Fixico, D. L. ed. 2007. Treaties with American Indians: An Encyclopedia of Rights, Conflicts and Sovereignty. ABO-CLIO. ISBN: 978-1-57607-880-8. Fixico, D. L. 2006. Daily Life of American Indians in the Twentieth Century. Greenwood. ISBN: 978-0313333576. Fixico, D. L. 2003. The American Indian Mind in a Linear World: American Indian Studies and Traditional Knowledge. Routledge. ISBN: 978-0415944571. Fixico, D. L. 2000. The Urban Indian Experience in America. University of New Mexico Press. ISBN: 978-0826322166. Fixico, D. L. 1998. Invasion of Indian Country in The Twentieth Century: American Capitalism and Tribal Natural Resources. University Press of Colorado. ISBN: 978-0870815171. Fixico, D. L. ed. 1997. Rethinking American Indian History. University of New Mexico Press. ISBN: 978-0826318190. Fixico, D. L. and F. W. Porter. 1991. Urban Indians (Indians of North America). Chelsea House Publishers. ISBN: 978-1555467326. Fixico, D. L. ed. 1990. Native Views of Indian-White Historical Relations. D'Arcy McNickle Center for the History of the American Indian, Newberry Library. Chicago. Fixico, D. L. ed. 1987. An Anthology of Western Great Lakes Indian History. American Indian Studies. Fixico, D. L. 1986. Termination and Relocation: Federal Indian Policy, 1945-1960. University of New Mexico Press. ISBN: 978-0826309082. Fixico, D. L. Between a rock and a hard place: The road of Native American environmental issues. In: Connell-Szasz, M. ed., Nations on the Move. State University of New York Press. Albany, NY. Fixico, D. L. Writing American Indian histories in the twenty-first century. In: Krupik, I. ed., Handbook of the North American Indian. Smithsonian Press. Washington, DC. Fixico, D. L. 2014. From Tribal to Indian: American Indian identity in the twentieth century. Pp. 473-495 In: Smithers, G. D. and B. N. Newman eds., Native Diasporas: Indigenous Identities and Settler Colonialism in the Americas. University of Nebraska Press. Lincoln, NE and London, UK. ISBN: 978-0803233638. Fixico, D. L. 2013. Wei Wir Black Hawk Vom Volk Der Sac Und Fox Erinnern. Pp. 139-147 In: Edenheiser, I. and A. Nielsen eds., Tecumseh, Keokuk, Black Hawk—Indianerbildnissen In Zeiten Von Vertragen Und Vertreibung (Portrayls of Native Americans in Times of Treaties and Removal). Arnodsche Art Publishers. Desden, Germany. Fixico, D. L. 2010. Understanding the Earth and demand on energy tribes. Pp. 21-34 In: Smith, S. L. and B. Frehner eds., Indians and Energy: Exploitation and Opportunity in the American Southwest. School for Advanced Research Press. Santa Fe, NM. ISBN: 978-1934691151. Fixico, D. L. 2009. The federal Indian relocation programme of the 1950s and the urbanization of Indian identity. Pp. 107-130 In: Bessel, R. and C. B. Haake eds., Removing Peoples: Forced Removal in the Modern World. Oxford University Press. London, UK. ISBN: 978-0199561957. Fixico, D. L. 2007. Witness to change: Fifty years of Indian activism and Tribal politics. Pp. 2-15 In: Cobb, D. M. and L. Fowler eds., Beyond Red Power: American Indian Politics and Activism since 1900. School for Advanced Research Press. Santa Fe, NM. ISBN: 978-1930618862. Fixico, D. L. 2004. Ben Nighthorse Campbell / Northern Cheyenne. Pp. 263-280 In: Edmunds, R. D. ed., The New Warriors: Native American Leaders Since 1900. University of Nebraska Press. Lincoln, NE. ISBN: 9780803267510. Fixico, D. L. 2004. Removal of the western Southeast Indians. Pp. 162-173 In: Fogelson, R. and W. Sturtevant eds., Handbook of North American Indians, Volume 14: Southeast. Smithsonian Institution. Washington, DC. ISBN: 978-0160723001. Fixico, D. L. 2002. Federal and state policies and American Indians. Pp. 379-296 In: Deloria, P. J. and N. Salisbury eds., A Companion to American Indian History. Blackwell. Malden, MA; Oxford, UK; Carlton, Victoria, Australia. ISBN: 978-1405121316. Fixico, D. L. 2002. The demand for natural resources on reservations. Pp. 207-218 In: Evans, S. ed., American Indians in American History, 1870-2001: A Companion Reader. Praeger Publishers. Westport, CT. ISBN: 978-0275972776. Fixico, D. L. 2001. Ethics and responsibilities in writing American Indian history. Pp. 2-7 In: Hurtado, A. L. and P. Iverson eds., Major Problems in American Indian History. Wadsworth, Cengage Learning. Boston, MA. ISBN: 978-0618068548. Fixico, D. L. 1998. Ethics and responsibilities in writing American Indian history. Pp. Chapter 6 In: Mehesuah, D. A. ed., Natives and Academics: Researching and Writing about American Indians. University of Nebraska Press. Lincoln, NE. ISBN: 0-8032-8243-5. Fixico, D. L. 1997. Methodologies in reconstructing American Indian history. Pp. 117-130 In: Fixico, D. L. ed., Rethinking American Indian History. University of New Mexico Press. Albuquerque, NM. ISBN: 978-0826318183. Fixico, D. L. 1996. The struggle for our homes. Pp. 29-46 In: Weaver, J. ed., Defending Mother Earth: Native American Perspectives on Environmental Justice. Orbis Books. Maryknoll, NY. ISBN: 978-1570750960. Fixico, D. L. and G. Auletta Young. 1995. Teaching American Indians (the minority of minorities) and higher education. Pp. 103-124 In: Bowser, B. P. and T. Jones eds., Toward the multicultural University. Praeger Publishing. Westport, CT. ISBN: 978-0275947675. Fixico, D. L. 1994. Columbus and the American Indian experience: Cultural destruction and historical distortion. Pp. 215-232 In: Lintvelt, J., R. Ouellett and H. Hermans eds., Culture et Colonisation en Amerique du Nord . Les Editions du Septentrion. Sillery, Quebec. Fixico, D. L. 1994. The urban relocation of Native Americans. Pp. 453-459 In: Chudacoff, H. P. ed., Major Problems in American Urban History: Documents and Essays. D.C. Heath and Company. Lexington. ISBN: 0669243760, 9780669243765. Fixico, D. L. 1994. Tribal leaders and natural energy resources, 1970s-1980s. Pp. 385-389 In: Chan, S., D. Henry Daniels, M. T. Garcia and T. Wilson eds., People of Color in the American West. Cengage Learning. ISBN: 978-0669279139. Fixico, D. L. 1985. Tribal leaders and the demand for natural energy resources on reservation lands. Pp. 219-236 In: Iverson, P. ed., The Plains Indians of the Twentieth Century. University of Oklahoma Press. Norman, OK. ISBN: 978-0806119595.